Did Dustin Lance Black just out Tom Daley as bisexual? 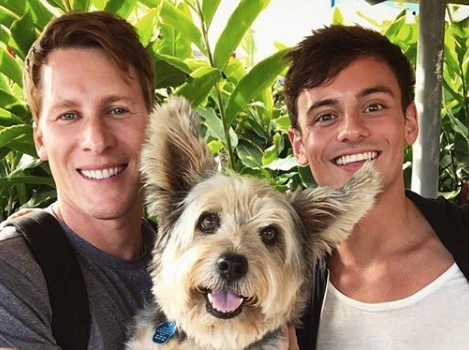 If you’ve been wondering how married life is treating Dustin Lance Black and husband Tom Daley, well, they have news for you. Talking to Attitude Heroes, the couple revealed there have been”struggles” since they’re apart so often — sometimes as long as five weeks at a time. Related: The Internet is losing it over this photo of Tom Daley. Perhaps you can see why. “Our relationship is far from perfect,” Daley says. Since saying he’s attracted to men in December 2013, Daley hasn’t defined his sexuality. @dlanceblack and I had the most amazing time at the @cambridgeunion last weekend! We also got to explore Cambridge and even managed to go punting, although it was much harder than expected! ? Check out my latest VLOG through the link in my bio now! ? #TBT to the last day of our trip to Hawaii with the cutie that is…STEWIE ? Click bait headline. Daley has always said he’s bisexual. jjose712, OMG. No. He didn’t say he was gay and he didn’t use bi as a stepping stone. What happened was this: Tom came out saying he liked men and also fancied girls. The Gays freaked out, wondered what that meant, made jokes, and dumped their own messy histories on him of using bi as a stepping stone (most gays are blissfully unaware that many bi men use gay as a stepping stone). A little while later, Tom was on a game show. In the middle of the game, the host asked “So, Tom, you’re gay now, huh?” To which Tom replied “Oh, um….” The Gay media took that to mean “Yes. I now identify as 100% homosexual and saying I liked women was just a stepping stone.” Fascinating how much we can project, isn’t it? And yet Gay men all over swear up and down that Tom officially announced he’s actually gay. Isn’t Tom a little long in the tooth for Dustin now? Daley never said he was bi. When he first came out he said he “still likes girls too”. And then he later said he was gay. This seems like a desire to create faux drama and get attention or maybe to get sympathy if things fall apart. Did they ever have a monogamous relationship? I’ve always just assumed they were both fvcking whoever. If that’s not the case it makes even less sense to marry a guy barely in his twenties (when you’re approaching 40), who only recently came out and who never had a real relationship, especially when you’re both still invested in your work and spending a ton of time apart. I want to not feel some type of way about this couple. But their whole thing has always come off as lame and temporary to me. OMG. No. He didn’t say he was gay and he didn’t use bi as a stepping stone. What happened was this: Tom came out saying he liked men and also fancied girls. The Gays freaked out, wondered what that meant, made jokes, and dumped their own messy histories on him of using bi as a stepping stone (most gays are blissfully unaware that many bi men use gay as a stepping stone). haha, Tom is one of the few ‘celebrities’ that I have actually met. I have met him twice through a mutual friend (not Dustin, thankfully, by the sounds of it) and he is most assuredly G-A-Y. I have heard of a couple of guys that Tom has ‘enjoyed’, but he aint been never a female as far as I can tell. On a side note, the brief interactions with Tom have been great, he seem like a sweet kid – but man, too young to be married…..
Dustin plucks him out as a teenager because that’s his thing and a father that just died so hello father figure. Now he wants to sew his oats with some real tops. Shocking. The whole “women still turn his head” stuff seems less like trying to claim Tom is bi and more like trying to claim he’s a narcissistic hoe who won’t do everything I claim, which is not a shock considering he’s 20. I’ll never root against them. There’s no real reason to. But an accomplished, apparently intelligent man approaching middle age has no business starting a serious relationship with a closeted and famous 18-year-old. Honestly, Dustin doesn’t seem like he “only likes ’em young” rather than he’s stuck in that dreaded Peter Pan syndrome that traps many gay and gay-leaning men for life. Yeah, I don’t think it was just coincidence he used to hang out at Bryan Singers infamous pool parties. He was definitely part of that group. I’m not saying that he isn’t a part of that group, just that it seems like his desire to be with young men isn’t driven by his attractions and desires being almost strictly with them but rather a desperate need to hold on to his youth. I have a feeling Spacey is similar, though of course his behaviors have been well-documented. He very well could have been joking/trolling. But Dustin is a smart man. He knew that comment would blow up and be taken out of context even if it was a joke. So, it was ultimately about getting attention or trying to shame Tom. My feeling is that Tom may be getting clucky and seeking a woman’s uterus for the purpose of breeding. Perhaps he has innate heterosexual impulses that are revealing themselves. So, now you have a theory that some gay men have an instinctual need to breed? Wanting to have kids has nothing to do with attraction, desire, passion or romance. It’s not even a “hetero impulse”. There are many gay and straight people who are interested in having kids and many who are not. Also, I doubt Tom at 20 is thinking about children. That’s more a “dealing with mid-life crisis and feelings that you have no purpose” scenario. DLB is beginning to look like a wax figure. Needs to either cut back on the selfie filters or the facial injections. Where’s the coverage of MSNBC’s Joy Reid issuing an apology for homophobic comments she made against Gov. Charlie Crist? This is a good time to start a national conversation on the pervasiveness of homophobia in the black community. Hmm. Actually, we should address a problem that’s far more common: idiot commenters trying to stir up trouble. Here is yet another celebrity couple who might want to consider keeping their private life a little more private — or a little less public, however one chooses to view it. Once things get out of hand it’s very difficult to put the genie back in the bottle. Daley has been consistent in his statements about his attraction to both men and women; pretty sure I’ve never heard him say he is gay/homosexual. Anybody else remember when Elton John was “bisexual”? Isn’t it known that Tom cheated on Dustin once? And it was with a guy–not a girl. Tom is not bi, he’s insatiably gay. Dustin is just saying what he is expected to do, that his husband isn’t a liar.